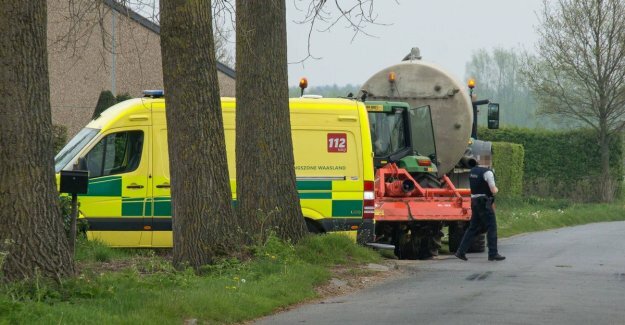 Sint-Niklaas In the Hondsneststraat in sinaai, belgium Wednesday afternoon a 74-year-old farmer to the life in an accident with a tractor. The public prosecutor has an expert on site to control the exact circumstances of the accident. The accident happened around 14 hours when performing a maneuver of a tractor. The victim is a 74-year-old man from sinaai, belgium. It is still unclear how the accident exactly happen. A 42-year-old driver from Zwijndrecht was a party involved. The emergency services tried to the farmer even on the spot to revive him. He was in critical condition transported to the university hospital in Gent, but died there shortly after arrival. The Hondsneststraat is currently closed to all traffic. The verkeersdeskundige of the parquet is on the spot for the necessary findings.